Five things in this world that escape me. Some years ago, I took a course on Foucault and, for the most part, followed it. It was rather like my first sexual experience in that I didn’t really enjoy it and felt I could have been spending my time more productively elsewhere, but in for a penny (or an overpriced semester), in for a pound. I say this not to give you the heebie jeebies picturing my rather drawn out and honestly humdrum sexual initiation. I just want to point out that I am not completely devoid of cognitive spark before I cover the five things that escape me. 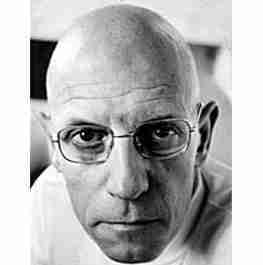 You may need to pop back up here periodically and gaze into the très smart eyes of M. Foucault. He’s piercing you with les smarts. 1. Radio Waves. Before the geeks out there rush to explain this to me, I have had it explained. Repeatedly. I get how simple it is. In fact, its simplicity is what freaks me out. Continuous waves of information pulsing by, through and near us all the time. Seriously, get your head around this…a transmitter miles away sends out radio waves which are picked up by the radio by your bed, which converts them into music. What. The. Hell. Music out of thin air. TV shows out of thin air. Thin air. You can’t see them and they are there all the time. We are drowning in radio waves. They go through walls. RIGHT THROUGH WALLS. I need to move on to #2 before I give in to my urge to crawl into my closet for a few days.